On Thursday I had the pleasure of viewing the 'transformation' of the Guildhall Art Gallery which involves a radical rehang, the first in 15 years, extended wall space, specially designed LCD lighting, as well as new interpretations and branding by introducing original 'icon' designs, text panels and new captions. The gallery is open to the public from 16th January 2015. The Guildhall Art Gallery collections originate from 1670 and today total 4500 artworks from bequests, commissions and acquisitions over hundreds of years. 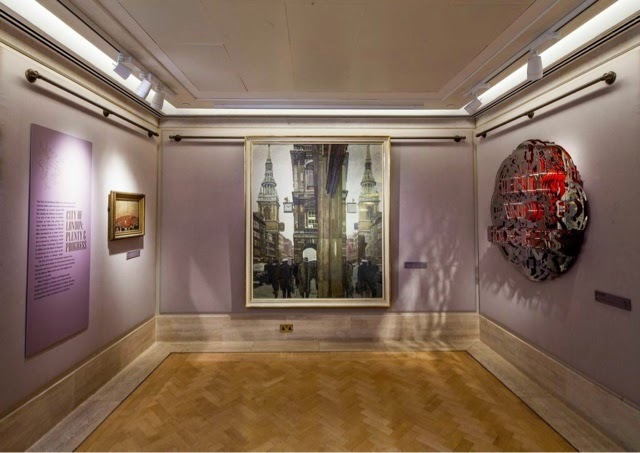 It comes as no surprise that the bulk of the collection consists of internationally renowned Victorian art and views of London, within and without the Square Mile. On display are some of the first acquisitions from C17th and the most recent Mark Titchner Plenty and Progress 2012. 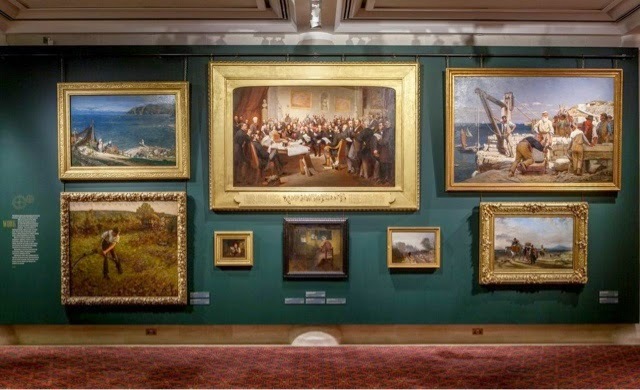 The main gallery (see banner and photograph above) displays the Victorian paintings following themes on every day subjects, which occupy us to this day, which suggests this style of art is never really 'out of date'. 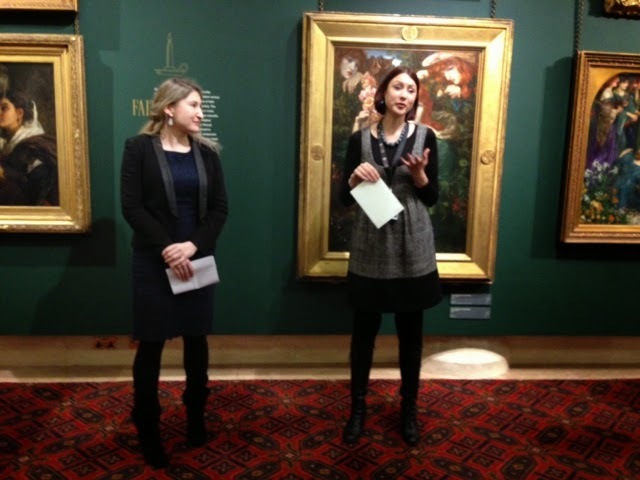 In the explanation given by Julia Dudkiewicz (Principal Curator) she talks of the dichotomy of the themes, material wealth and faith, reality and imagination, work and leisure, and this is all cleverly presented on the gorgeous 'Aesthetic Movement Green' walls. The interpretations for each area are clear and concise guiding you to the next theme, thought provoking and encouraging you to engage with this innovative approach to viewing the depiction of contemporary life in C19th. 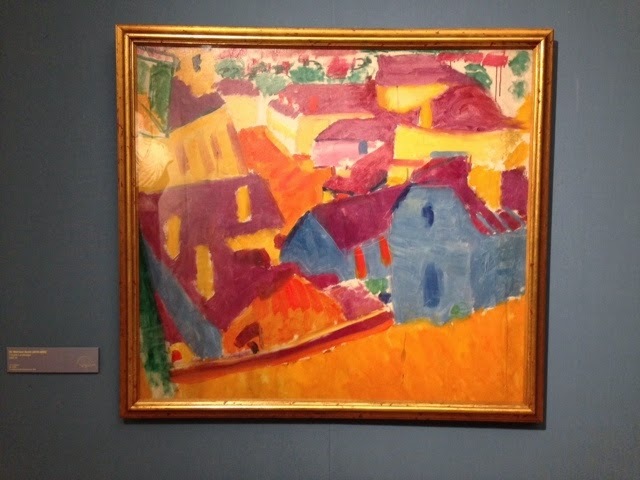 The increase of wall surface area has allowed for the overall number of paintings on show to be doubled! I also love the use of chains and close hang reminiscent of the original Victorian exhibition style , yet avoiding the hang 'em close, hang 'em high. In the Ground Floor Gallery (see above) you have the 'City' where you will find the newest acquisition on the right. Moving down to the Long Gallery you will be on the theme of 'Outside' where you will find Landscapes of Sir Matthew Smith, a particular favourite of mine, his lesser known works. As a shell-shocked patient his psychiatrist suggested he use 'rounder' shapes in his work, seek and you will find in these colourful paintings. Also do not miss Smith's, never displayed before, sketches of WWI prisoners-of-war in a (temporary) exhibition leading off the 'London' Gallery. In the Undercroft Gallery - 'Picturing London: 400 Years' - Always a favourite with the City Guides and I am pleased to report that one of our most useful 'tools' to describe civic and the ceremonial in the City is still presented - The Swearing in of Alderman Nathaniel Newman 1782 - William Miller. With another interesting piece displaying the glorious pageantry of The Lord Mayor Proceeding to Westminster Hall 1789 - Richard Paton, figures by Francis Wheatley RA. Also the 9th November painting is also on display. Victorian female artists (not English) are also represented, look out for Elizabeth Stanhope Forbes and Marie Anne Stokes in the Main Gallery. The rehang has been conceived and developed by Julia Dudkiewicz (below left) working with Exhibitions Curator Katty Pearce (right), logistics by Jeremy Johnson. The new branding developed in collaboration with Crescent Lodge Design, and the lighting by Nicholas Belfield of DPA Lighting Design. Just to remind you, Tower Bridge. A Celebration of 120 Years. 1894-2014 Exhibition bringing together 80 rare and exceptional images of the bridge from every decade of its history is on show until 26 April 2015 - Free entry. Also, if you have not done so already, visit the new Heritage Gallery displaying the City of London's very own copy of the Magna Carta. Plus the Amphitheatre accessed via the Undercroft Gallery. Special thanks to Chloe Nelkin Consulting for professional photographs of GAG. How do you protect works of art during renovations - read on. A Guide's Eye View of the City. A qualified City of London Guide. Sharing some of the wonderful histories, mysteries, oddities and wonders that are the City of London.